Secretary of State Mike Pompeo came to Israel Sunday in the midst of the worst crisis in relations between Israelis and Palestinians in years, but he did not meet a single Palestinian representative and mentioned them publicly once. For decades, American diplomats saw themselves as brokers between the two sides, and secretaries of state typically met Palestinian representatives on regional tours like this one. When relations between the two sides deteriorated, the United States sought to bridge the divide. No one at the State Department called Palestinian leaders to ask for a get-together with Mr. Pompeo, according to Palestinian officials. And that may be because the Americans knew the answer they would have gotten: No. In January, Vice President Pence tried to visit the Palestinian leadership and he was rebuffed. And the method of refusing to meet him was calculated to be an insult to him and to the United States. Since then, the Palestinian leaders have led the charge in trying to isolate the US at the UN, with anti-US Security Council and General Assembly resolutions. “No meeting in Ramallah on his first visit sets an ominous tone about prospects for any progress, or even dialogue, with the Palestinians,” said Daniel B. Shapiro, an American ambassador to Israel during the Obama administration. It is possible that Shapiro and Miller – who are no idiots – also blamed the PLO’s intransigence in their interviews, but the New York Times isn’t interested in assigning blame anyone but members of the Trump administration. 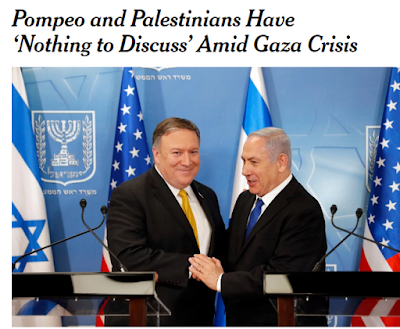 Oh, and that headline that implies that Pompeo is the one who said they have “nothing to discuss” was actually a quote from a PLO official, in paragraph 6. Would it have been better for Pompeo to have publicly announced he wanted to meet with Abbas, to be humiliated again? Apparently that is what the New York Times wants. To the editors of that newspaper, the Palestinians have no responsibility for their actions. On the contrary, their anti-peace actions are considered reasonable.